The WooCommerce KB Articles plugin installs a new Post Type in WordPress, specifically for KB Articles. You will find this new Post Type in the main menu (screenshot below). The available options are as you'd expect; i.e., Add Article, Categories, Tags, Options, etc. 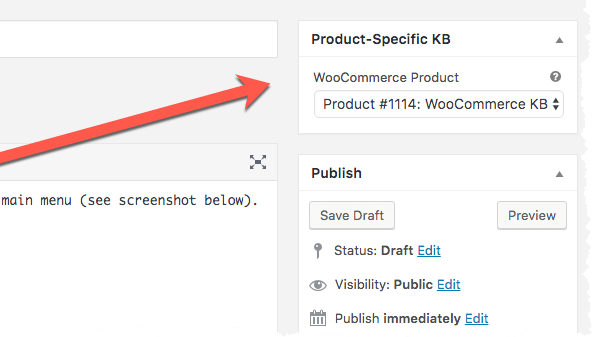 When you create a new KB Article, you can choose a specific WooCommerce Product that the article is being written for. This option is exposed by the Product Meta Box in the KB Article editing station. Choosing a specific Product is optional, but suggested, as this allows KB Articles to be displayed in Product-specific ways; e.g., in Post Type Archives, on the Product page itself, or by using the [kb /] Shortcode. Categorizing (and/or Tagging) is accomplished in the same way you create Categories/Tags for any other Post Type. 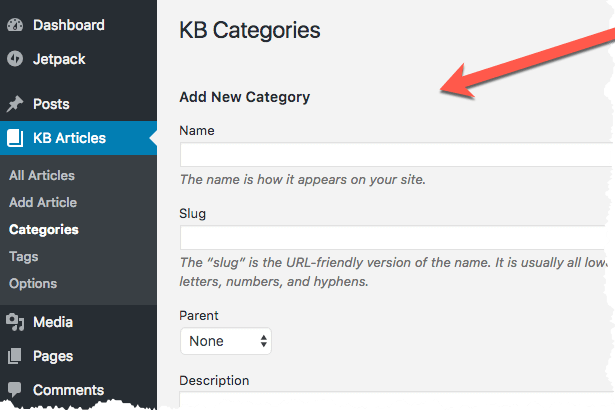 And, just like any other Post Type in WordPress, Categories & Tags for KB Articles are global in scope; i.e., can be used for any KB Article, no matter the Product. As noted previously, Categories & Tags are always global in scope. However, they are also automatically separated when viewed on the front-end of your site. For example, whenever a Product-specific KB is being viewed, an automatic separation occurs. This automatic separation is accomplished by filtering the list of Categories/Tags to only those which have been applied to KB Articles for a specific Product. The end result is that each Product will have KB Articles, and a reader will see a list of Product-specific KB Article Categories and Tags. The thing to remember is that Categories and Tags are created in a global scope behind-the-scenes, but presented in a Product-specific way on the site. This means you don't need to worry about separating Categories or Tags (i.e., by Product) whenever you're publishing Articles. This separation occurs automatically based on the Categories you place an Article into, or on the Tags you've given Articles that are associated with any given Product. Note: Permalinks generated by the WooCommerce KB Articles plugin are customizable.